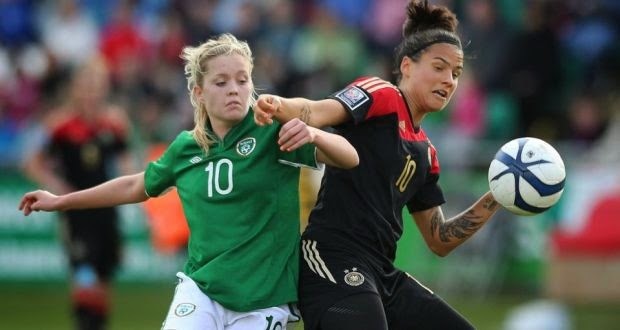 The Irish soccer team came achingly close to a surprise victory over Germany at the weekend, but it wasn't to be. The final score after a last-minute goal was Rep of Ireland 2 Germany 3. There's a full match report online here if you need it, but this post is more of a look behind the scenes at the team's efforts. There's been some Twitter noise in Ireland about the women's team allegedly losing their 'per diem' allowance this year, and claims the men get better treatment. But when I looked into it with the Football Federation of Ireland, that's not exactly the whole story. "The per diems (daily allowances) were taken away but that happened to all international teams in the FAI except the senior men's squad. We were treated equally. Our budget for the senior team this year is €360,000 – double the amount of the men's U-21 team. The players don't want for anything when they're in camp – they stay in top hotels like Carton House. Our squad has played 24 internationals in the past two years compared to 15 in the three years before that. We're aiming to raise the profile of women's football – that's what the money goes towards." These are things we don't highlight enough I think when it comes to women's sport - it's not all bad news all the time. The figures show €1.14m has been spent on the women’s senior team in the last three years. And a spokesman said this year the planned spend is higher than ever. Much of this money goes on behind-the-scenes work - things like training, backroom team and dietary requirements. The training camps might open your eyes - a week in January with two "games behind closed doors" against Holland and England, at La Manga football club/resort in Spain. This was followed up last month by 10 days at the Cyprus Cup. Ten days, four international matches against New Zealand, South Korea, Switzerland and Canada. The players on the Irish team all play with clubs as well in the Bus Eireann National League. But just in case that training isn't enough they also do weekly strength-and-conditioning as a national squad. The spokesman also pointed out that the great (my word) facilities at Tallaght Stadium are now available to the women for all home matches. So there you are, women's soccer in a pretty healthy state in Ireland. All you have to do now is get down to some games! Women’s emerging talent programmes have been set up U12, U14, U16, U18 nationwide. Bus Éireann National Women’s League - €300k spend in last three years. Soccer sisters programmes rolled out nationwide for 921 participants annually. FAI Summer soccer schools had 1800 female participants last year. FIFA Live Your Goals programme for female players saw 987 girls participate in five separate venues. Numbers of registered female players have doubled in the last five years. I witnessed the sadest indictnent of emerging girls soccer in ireland in the oscar traynor grounds on the 14th of april 2014. Mgl officals let a team from shelbourne comprising legitimate u18 players and cup tied, as in disalllowed u16 players take to the pitch in the carlie fitzgerald memorial cup and awarded the cup to a team that blatantly and flagrantly broke the rules of their own competition against a legitimate rival. It is soccer and the reputation of the mgl that were the losers yeaterday not the dignified players from newtown fc. No child should be asked to go onto and remain for 90 mins on a pitch with an opposition that breaks the rules. I feel it was a show of compleye disrespect from ahelbourne fc, their players and tje mgl to the memory of carlie fitzgerald. @Anon - thanks for taking the time to comment in such detail, I will look into that incident and see what went on. From what you're saying it sounds quite irregular.